The progressive globalisation of business and the growing importance of China as an economic and political power make an understanding of the workings of Chinese law increasingly necessary for business people, lawyers, politicians and scholars. The last twenty years have seen a period of rapid change in the Chinese legal system, and law and regulation have played a crucial role in the development of the modern Chinese economy. A multiplicity of laws and regulations passed every year by governments at various levels make the study of Chinese law an increasingly complex task. A comprehensive presentation of Chinese law to foreign readers familiar with a very different legal tradition is a difficult task involving more than simple linguistic translation. Many rules, principles and practices of Chinese law can only be properly understood by applying Chinese legal thinking and jurisprudence. Taking this into account, the editors and contributors have endeavoured to present Chinese law wherever possible from an angle accessible to those with a common law background, whilst necessarily retaining the use of Chinese legal terminology. 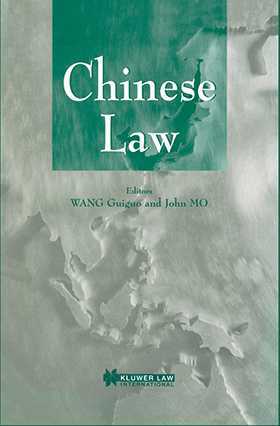 This book encompasses all of the most important aspects of Chinese law, and has a strong practical and case law emphasis which sets it apart from other studies in the field. Edited by eminent academics at the City University of Hong Kong, Chinese Law offers the most up-to-date, detailed and comprehensive coverage of the subject ever published in a single volume.